This piece was kindly contributed to our collection by its composer, Jeffrey Harrington. “À part” is a meditative piece which uses rhythmic quirks to create the effect of two voices at once, but without the virtuosity required to create the illusion in my other recent solo flute pieces. 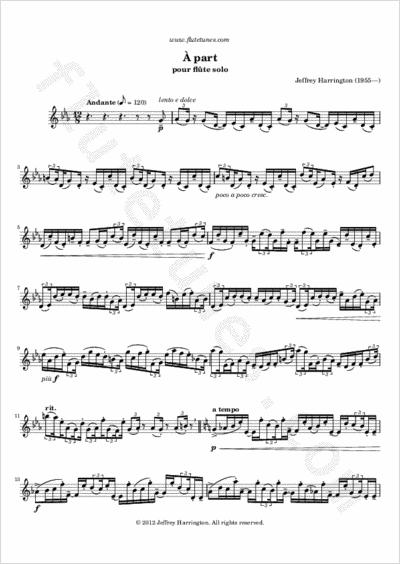 I had been writing a solo flute tango when this rhythmic figure appeared, and it seemed too lovely to ignore; the piece ended up revolving around it and expanding it. The title comes from the generally melancholic mood throughout.